There are several backup plugins for WordPress. 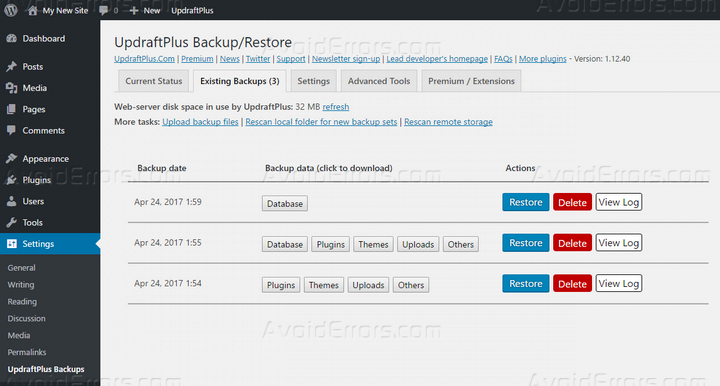 In this tutorial, I will show you how to create a backup with the UpdraftPlus WordPress Backup Plugin. As you can see, the settings options are divided into several tabs. Before we create a backup, we need to set up the backup options first. In the “Settings” section, the first two fields enable you to choose the backup schedule for your files and database. Next, you have to pick a cloud storage where you want to save the backup files. UpdraftPlus supports all the popular ones including Dropbox, Google Drive, Amazon S3, OneDrive, Azure, Rackspace, FTP, and Email. You have to connect UpdraftPlus with the chosen cloud service. The connection process varies depending on the service. Click on your preferred cloud storage service, and you will find detailed instructions about the connection process below. In the “Include in files backup” field, you can choose which items you want to backup. 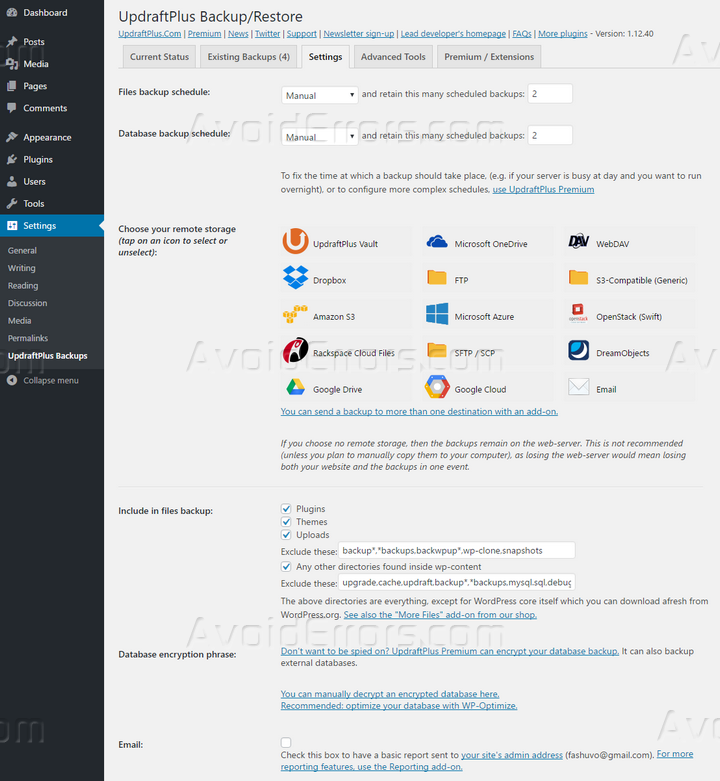 You can choose themes, plugins, uploads, and any other folder. It is possible to exclude specific files or directories from the uploads and other folders. Once you have made the necessary changes, click the “Save Changes” button at the bottom of the page. Send the backup to your preferred cloud storage. Next, click “Backup Now.” This will start the backup process. You can check out the backup progress at the “Backups in progress” field. The backup process may take some time depending on the amount of content, themes, and plugins of your website. You have to wait till the backup is finished. However, it is also possible to stop the process manually. At this point, you have created at least one backup of your website. You can find the backups in the “Existing Backups” section. This page will show a list of all the currently available backups. 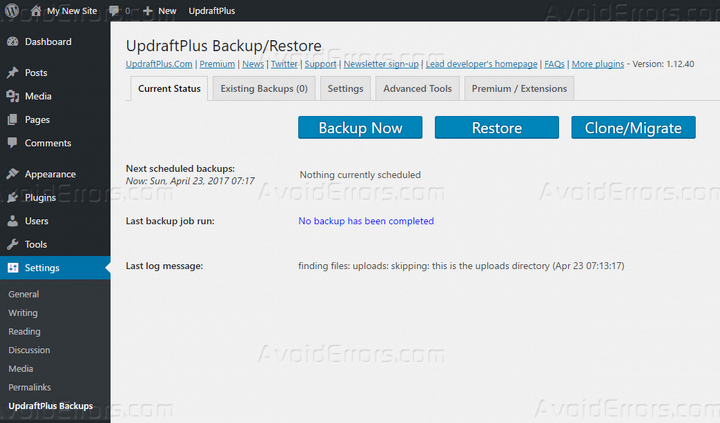 For each backup, you can check out the date and what type of data it includes. 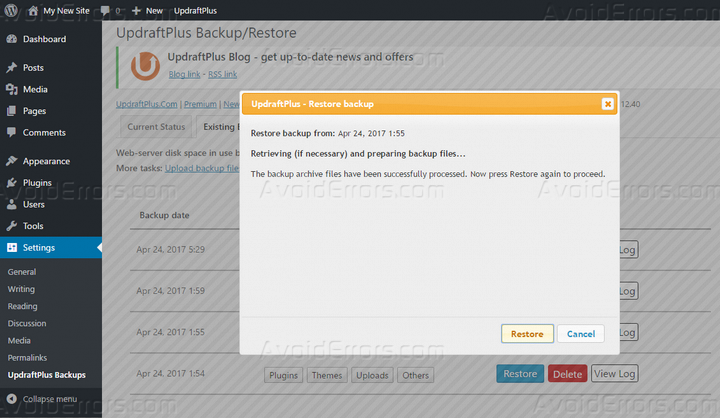 It is also possible to restore, delete, or check out the log for that backup. Clicking “Restore” enables you to choose which type of data you want to restore. Click the “Restore” button again. At this point, the actual restoration process will begin. It may take some time depending on the backup size. You will get a success message once the process finishes. UpdraftPlus makes it really easy to schedule regular backups of your WordPress site. To set up the backup schedule, go to the “Setting” section. Here, you can set up the backup frequencies for the database and website files. For each of these, you can choose to keep manual backups, or have a backup every 4, 8, 12 hours, or on a daily, weekly, fortnightly, and monthly basis. It is also possible to choose how many scheduled backups you want to save. After making the changes, click the “Save Changes” button. This will save the schedule and perform the backups in time. You can check out the upcoming backup schedule from the “Current Status” section. There is a premium version of UpdraftPlus. 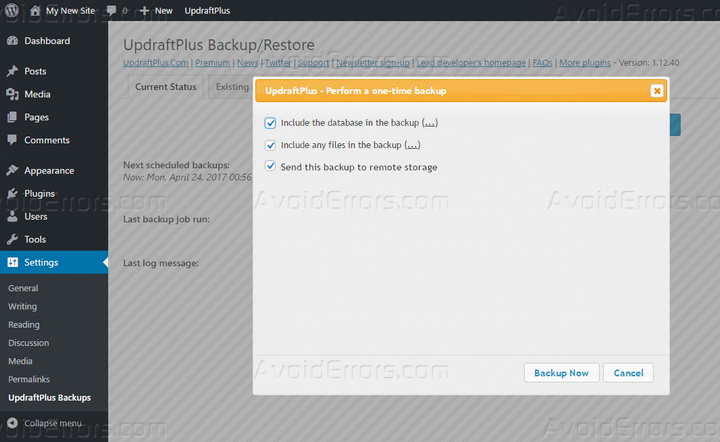 It comes with all the features and add-ons available for the backup plugin. For instance, you can choose custom times for the backups. 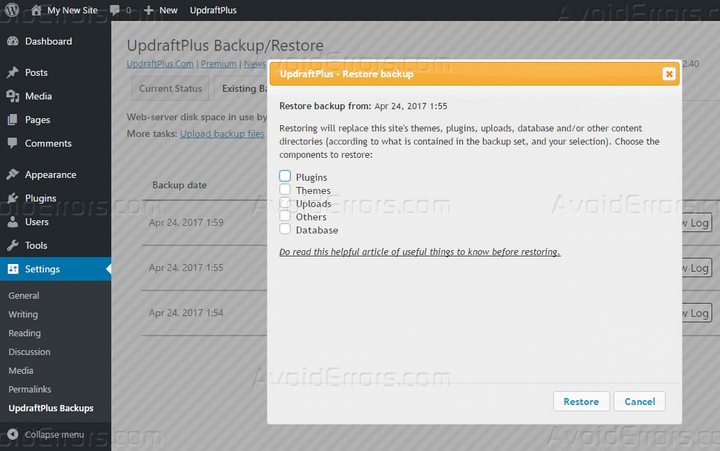 The plugin will automatically perform a backup before WordPress core updates. The premium plan includes 1GB of storage in UpdraftVault Storage, where you can store the backup files. It also enables you to save the backup on multiple cloud storage services. The encrypted transportation system will ensure the perfect security for your website data. When using the premium version, you can get support through the forum or ticketing system. The personal license is priced at $70, which includes two websites. Having a regular backup schedule is an integral part of your website maintenance. 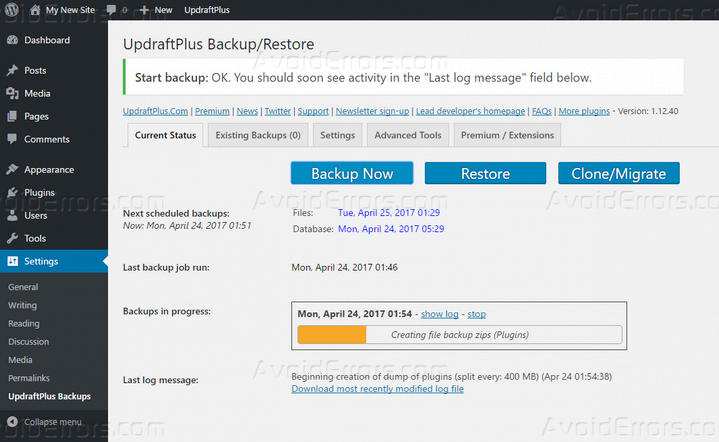 Now that you know how to use UpdraftPlus to back up your WordPress site, you should create the schedule as soon as possible. Let me know if you need any other help in backing up your website. I will be glad to help you out.